Welcome to the DutchGrid CA. For user certificates, the preferred application processes is to use the fully interactive client tool jGridstart - the GUI based application wizard that will guide you through the entire process in a few simple and easy steps. If, for some reason, this tool does not work for you yet for personal certificates, please get in contact with us to resolve the issue and meanwhile follow the process detailed below. Start your application process by clicking the Request a personal or host certificate link to go to the web form registration page. Please provide your personal details in the form provided (step 1). If you are requesting a personal certificate, your given name(s) and your family name (in that order) will be used to construct your certificate common name. 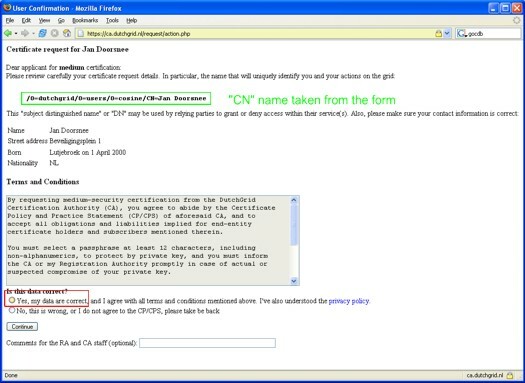 Once you've completed your contact details, please select your type of certificate: "user" or "host", and subsequently select your organisation (step 2). Depending on your organisation, you may also have to select your organisational unit. 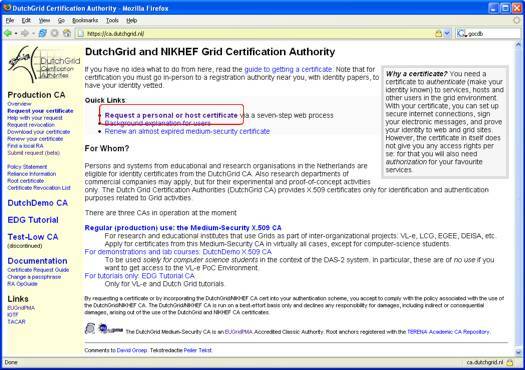 If you are requesting a host certificate, you will have to provide the host name at this point as well. Usually, this is the fully qualified domain name (FQDN), such as "grid.example.org". In specific cases (your middleware documentation will say so), you should ask here for a service certificate, which looks like "ldap/info.example.org". 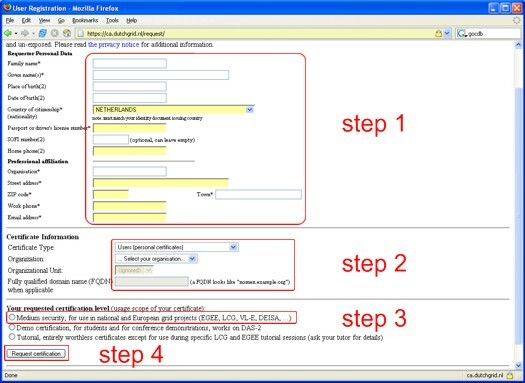 In step 3, select your certification level. In virtually all cases (unless you're a student trying to use the computer-science-only DAS-2 system) you should select Medium security at this point. When the form is complete, press the Request Certificate button at the bottom (step 4). You are now presented with a confirmation screen. Please read through the acceptable use policy, and if you agree, check the Yes radiobutton at the bottom. Then, click the Continue button. Download the PDF application form. This PDF file, which has been partcially filled for you already, you should print on paper and then complete the top section of the form by hand. You will see a place where to fill a Proof-of-possession challenge, which you will get when you run the script from step 2 immediately below. Download the request generation script, using any of the buttons of step 2. There is a version for Unix and one for MS-DOS and Windows, but if you have the choice please do use the Unix (Linux) version, as it has a better interface. You can store the script by downloading it via the browser and saving it to disk, or by displaying it and copy-pasting the entire script into an editor on the (Unix) system where you want to get and use your certificate. The suggested name for this script is makerequest.sh. On this system, which you must trust and where files will live for a long period of time, you will generate the key pair that is associated with your certificate. Now, run the script makerequest.sh, from a system prompt. In order to run the script, you should have openssl in your path. This script can be run without any arguments, in which case the certificate request, and the associates private key will be generated in the ".globus" subdirectory of your home directory, or - in case this one already exists - a variant name thereof. However, if you do provide an argument, this argument specifies the directory in which the certificate request and the key pair will be created. If you requested a personal certificate, you will now be asked for a passphrase. 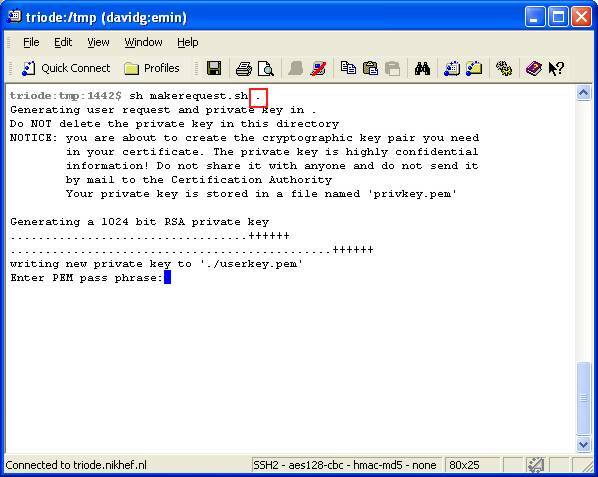 This passphrase, just like a normal password, will be used to protect access to your private key, the piece of private data that will be used to authenticate you and prove your association with the certificate. Remember that your private key should never be disclosed to anyone but you yourself. 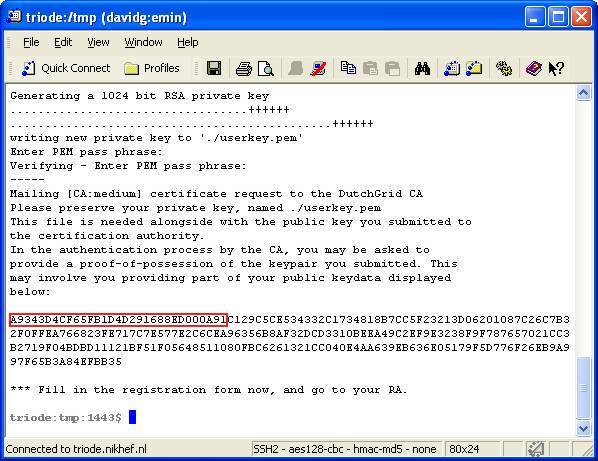 Although your certificate is public (it can and will be sent via email &c), the private key is very private, and if you give away your key, anyone with that key can impersonate you! Choose a strong passphrase of at least 12 characters, mixing in upper- and lower case letters, digits and special characters. Only if you are generating host certificates, you will not have to enter a passphrase, as the key pairs for these host certificates are only protected with the simple unix permission scheme (but then, they are bound to only one host). After you provided the passphrase (you have to give it twice to prevent typing mistakes), the key pair is generated for you and a proof-of-possession challenge is displayed. Write the first 20 characters of this challenge on the paper form you printed earlier. In case you ran this script on a Unix host, it will attempt to send mail automatically and thus submit your request. If your system cannot sent email, if your mail is modified in-transit (MacOS), or if you use an MS-DOS or Windows system, submit the generated request file, called certreqXXXXXX.txt that has been written to the directory, via the web upload interface. The electronic part of your application is now complete. Take the paper form to your nearest RA (his or her name is written on the paper form), and prove your identity to the RA. 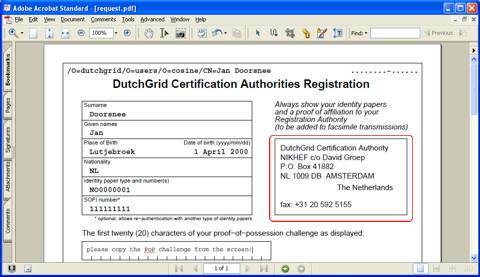 He or she will then counter-sign the form and hand it back to you, for mailing or faxing to the Certification Authority. The address and facsimile number are printed on the top-right hand corner of the form.